Planning a twin baby shower can be both fun and stressful. Twins are so rare, so special, that you want everything to be perfect. The first thing you may want to decide upon is a theme for the baby shower. It doesn’t need one, of coure — a baby shower for twins is a theme in itself — but a theme will help you pick out the decor, gifts, favors, and even the games. We had multiple showers when we were expecting twins, and they were lots of fun. Between that and a little research, we’ve come up with these favorite twin baby shower theme ideas. Some of these are centered around the idea of multiple babies, some are just cute baby shower themes that would work for single-baby showers too. 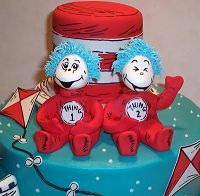 One of the cutest themes for baby showers is “Thing 1, Thing 2,” two characters from Dr. Seuss’s best-known book, The Cat in the Hat. These blue-haired twins, and Dr. Seuss in general, make for a fun theme for any party. The classic red-and-blue colors make for some bright, cheery decorations. Think cupcakes with blue frosting, or a red-and-white frosted “Cat in the Hat” cake. 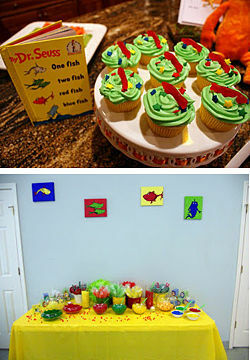 The book One Fish, Two Fish, Red Fish, Blue Fish by Dr. Seuss makes a great theme for single or twin baby showers. Fish candy or crackers in bowls or gummy fish cupcakes will get you started. The Cat in the Hat. Party hats and decorations, or the gorgeous cake at right. Green Eggs and Ham. Deviled eggs with green food coloring should do the trick. The Lorax. That’s your excuse to decorate with trees, fish, monkeys, you name it. A cute movie, too, that you could have playing in the background. Monkey friends. 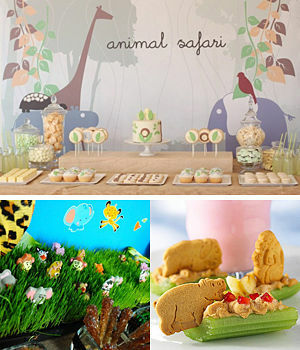 Giraffe, lion, rhino, hippo, and other safari animals make for lots of great decor options. You can put them on the shower invitations, the cake, the favor bags, whatever. Wheat grass centerpieces. Inexpensive potted wheat grass creates a jungle landscape. Hide animal lollipops in them for a true safari effect! Go bananas. Play up the monkey-see-monkey theme with bunches of bananas that everyone can take home for a healthy snack! Safari snacks. If you really want to impress. Celery, animal crackers, peanut butter and fruit. I would be remiss not to include the Peas in a Pod theme for twin baby showers. This theme might be over-used, but it’s practically synonymous with expecting twins. With green as the main color, it works for boy twins, girl twins, or boy-girl twins equally well. Of all the twin shower themes, this is probably the easiest to pull off. 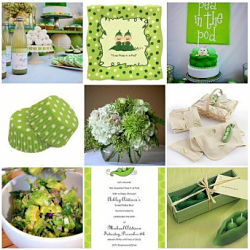 All you need to do is go green: green invitations, foods (cupcake liners, frosted cookies, and salads, for starters). Real plants and/or green confetti (the kind used in Easter baskets) offer some nice backdrops. And there are literally thousands of party supplies along this theme that you can order to decorate for it. Here’s a fun twin baby shower theme that the parents-to-be will love you for: a diaper drive. Think about it, they’re going to change 1400 diapers in the first three months. That’s just insane, and it’s expensive too. A diaper drive twin shower is such a great way to get them started. 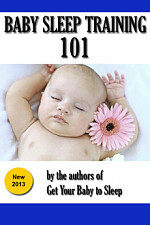 You might make this an optional shower game, with a prize to win, rather than an alternative to baby gifts. That could be stated on the invitation. This way, people who really want to shop for cute baby gifts can do so, and the new parents still get some diapers. 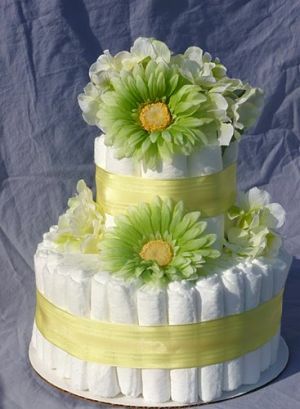 A diaper cake like the one at left is an ambitious but striking decorative item. You can get a kit on Amazon or even order a pre-made diaper cake. Fun game idea: Get several different kinds of candy bars and smash each one in a diaper as a sort of “baby poop”. Everyone guesses which candy it was, and the winner gets a prize. The diaper game kit diapers for this because they’re little and cute. will fill them with glee. to win a great gift or two! 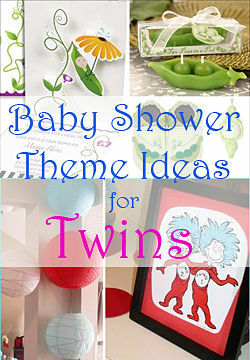 Have you come across any other ideas for twin baby showers? If so, please leave us a comment below! I also got twin boys, they are 6 years old now, i still remember how difficult it was for me to plan the baby shower event. Hannah, thanks for the comment. You had to plan your own baby shower? That is rough! We just found out we are having twins. i am planning my own baby shower. the theme is the circus de Baby.